The up/down counter counts binary pulses, and transmits the counter state, in an electrically isolated form, to the higher-level automation device. 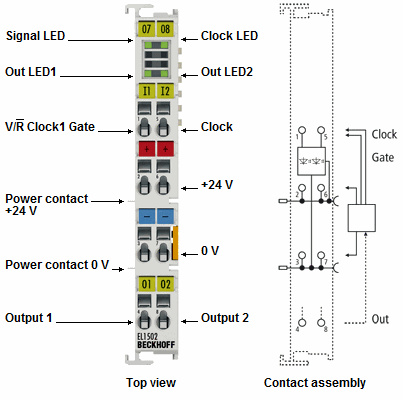 In the EL1502 EtherCAT Terminal it is possible to choose the (32 bits) counting direction using the up/down input, the gate connection can be used to control the triggering. Using the Clock1 input it is possible to implement two (32 bits) counters. The EtherCAT Terminal contains two inputs that indicate their signal state via LEDs. Both outputs are switched according to the counter state, so that they can be used as fast control signals for field devices. The EL1502 device supports the distributed clocks function. This means that the counter can be read at constant intervals (DC precision < 1 µs).